The financial crisis in 2008 was merely a preview of much deeper problems within our financial system, the so-called “tip of the ice berg”. The normalcy bias prevents many people from facing these problems, let alone even attempting at beginning to understand them. I enjoy studying finance and economics entirely too much to fall victim to this mental state, not to mention I feel that I have a moral obligation to explore these issues our global economy is now faced with and provide people with a way to actually profit from them (or at the very least, not lose half of their retirement when the equity markets plunge again). I’m going to assume the majority of people reading this already have a concrete understanding of what happened during 2008, so I won’t reiterate the details. Instead I will focus on what is happening now and how it is going to affect us, primarily in the way of our investment portfolios. Some of my constituents in the finance world may not see this as prudent, as the larger institutions and the mass media will tell you that our economy is doing great. I may say that too, if I was in the business of collecting fees based on AUM, but I’m not. Others may say I’m “fear mongering”, and I would tell those who believe that to click the link on the aforementioned phrase of normalcy bias. 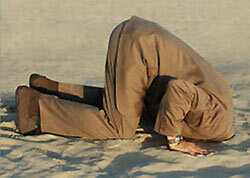 You can make like an ostrich and stick your head in the sand, pretending like nothing is happening and hoping for sunshine and rainbows when you pull your head back out; OR you can choose to educate yourself and hold your head high for taking your financial future into your own hands and maybe even profit from this next financial crisis looming on the horizon. After the housing bubble burst, Wall Street quickly had to devise a strategy for new products to peddle to consumers. With names like “high yield bond funds” and “focused credit funds”, investors began pouring money in with many of them having little understanding of the underlying investment strategy, let alone that these funds are essentially built on buying junk bonds. The assets that make up these funds are broken into three tiers or investment levels with level 1 investments being the most liquid, level 2 investments not having a readily available liquid market, and level 3 investments being almost impossible to value and not having a liquid market at all. Many of these funds have over 50% of their money in level 2 and 3, with some funds having over 90% of their assets in level 2 and 3, meaning in some cases that only 10% of the fund can be readily liquidated. A recent SEC N-Q filing by Deutsche High Income Trust shows $176mm+ in debt holdings, with only ~$2.4mm in level 1, ~$173mm in level 2, and ~$1mm in level 3. This translates to less than 2% of the investments having a readily available liquid market. iShares iBoxx High Yield Corporate Bond Fund (HYG) is a popular ETF which broke a key support level at $90/share last June and has been in a down trend ever since. Keep in mind that HYG does not hold any level 3 investments but the majority of these funds do; debt that could turn toxic any minute much in the same way mortgage-backed securities did in 2008. In an article written in Time magazine in September of 2015, the Office of Financial Research, setup inside the Treasury Department after 2008 to conduct forensic investigations into the causes of financial crisis, named corporate debt as it’s biggest concern. “High yield bonds in particular were a cause for growing consternation…..increasing the risk of a domino effect were the corporate bond markets to plummet as interest rates rise.” Legendary investor Carl Icahn is concerned as well, saying the long-term low interest rate environment “forced a bubble….pushing people into high yield bonds” Will we follow Japan and Europe into negative interest rate territory to prevent this bond bubble from bursting? When people are given access to credit for things they really can’t afford, the allure of owning that shiny new object causes irrational decisions to be made. I believe people have every intention of making their debt payments, but these same people default on loans because sooner or later they cannot afford to pay them- but if the U.S. economy is rebounding and we are doing so well, why can’t people pay for their cars? I’m not going to dive into politics here, but a recent article in Fortune titled “Donald Trump is Right: America’s Real Unemployment Rate is 40%” should shine a brighter light on what is really happening in the U.S. at the jobs level. To get a larger picture of what is happening here, let’s move away from the debt markets for a moment and look at what is happening in the equities market. 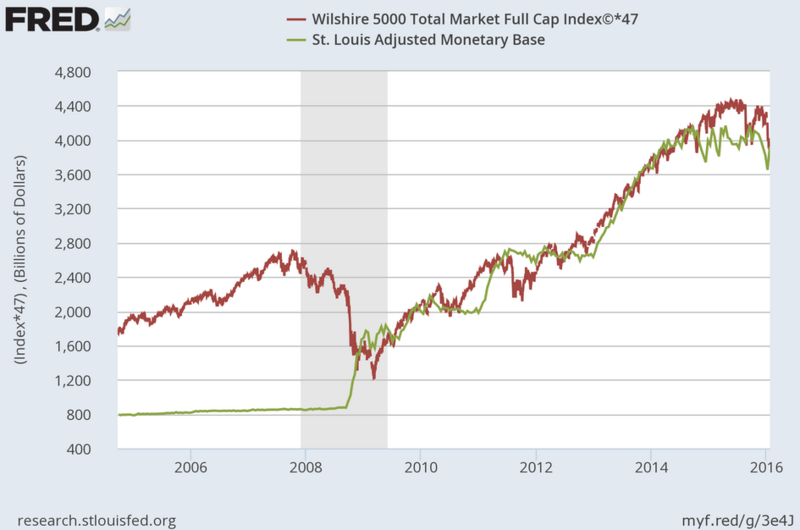 Since the financial crisis of 2008, the rise in the equities markets has been in direct correlation to the increased Federal Reserve monetary base. Coincidence? I highly doubt it…. It is no surprise that the Fed’s quantitative easing policy drove stock market prices up as interest rates fell to record lows and investors were looking for returns somewhere. The only place left for most investors to get that return was the U.S. equity markets. According to my research on the St. Louis Fed website, recessions happen every 2-9 years. That would put us in a recession in 2017 if my math is correct, but there is a fundamental problem with the very definition of “recession”. A recession is defined by a decrease in GDP for two consecutive quarters, so by the time we hear that we are officially in a recession, we have already been in it for 6 months! At that point, the big players have already begun capitalizing on falling prices by shorting securities so the premise of this article is to illustrate the immediate need to assess the current situation we are facing and position ourselves to take advantage of it before we hear about it in the mainstream news. Unfortunately I have yet to find a crystal ball, so none of us know exactly when things will begin to unwind, but we have had numerous conversations with many large fund managers that see a credit/currency crisis beginning sometime between October-November of this year, 2016. I’ve spoken to quite a few people (on Main Street) about my growing concern that we are headed for the next financial crisis, and many of them have the ostrich syndrome I mentioned earlier. Let’s add some color to this scenario to really drive the point home for them: if your portfolio loses 50% of it’s value (which happened to many main street investors and retirees during 2008), how much return must you earn in order to get that 50% back? If you said 100%, congratulations, you remember how to do elementary level math. If we look at the “Rule of 72” which is a shortcut to estimate the number of years it would take to double your money, at 10% it would take 7.2 years, and at 5% it would take 14.4 years. So on average, let’s say it would take about 10 years to earn back the money that was effectively wiped out, maybe more, maybe less.